"I want you to love me. I want you to trust me enough to let me love you, and I want you to stay here with me so we can build a life together. That's what I want." After two decades of being manipulated and mistreated, Sarah’s only option was to shut herself off emotionally to the rest of the world. Now, as a hardened prostitute, nothing fazes her and no one is able to crack the thick wall she’s constructed around her life. It isn’t until she meets a man named Michael Hosea that she learns God is about to turn her life upside down. Redeeming Love gets two thumbs ups and both hands don’t belong only to the female bibliomaniac. 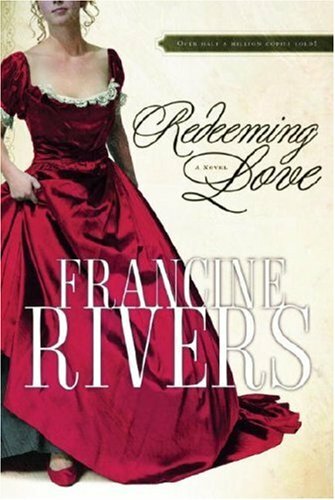 This novel is probably the best Christian Fiction we’ve ever read and loaded with inspiration. To read about the mistreatment of Sarah, almost entirely at the hands of men, was heart-wrenching. The physical and emotional scars the main character had accumulated over her life were so deep that every time she relapsed, it was easy to understand (yet so hard to read). And the villains... oh, did they ever boil our blood. The hypocrisy of their judgmental attitudes nearly caused us to start popping large quantities of blood pressure pills. The love experienced between the two main characters was truly remarkable and encouraging. It was also fascinating that through all the pain and hurt, it only took a handful of people showing kindness to start Sarah on the path to recovery. The plot never felt rushed and the problems felt realistic. Many of the characters experienced growth and it was great to be able to exert such a wide array of emotions. Whew... now I think we need a nap. Editor’s Note: For those male readers out there, Redeeming Love isn’t nearly as bad as the title suggests. However, in case of any temporary eye redness, we recommend two strong doses of Ian Fleming followed by twenty minutes of Clive Cussler. In more serious cases don’t be afraid to supplement with a movie containing deadly robots or droids. I'm glad you guys reviewed this one. It's been on my shelf for years, but the cover has always put me off. I'll have to finally pick it up. Soo happy you read and enjoyed this one! I cried my way through the end of this one. I was so impressed by how a biblical story came off as realistic and not at all 'preachy'. The lessons learned only made me look at my own life a little closer...really really great story! I have been meaning to read this one for such a long time. After reading your review I am going to try to get to it soon! Okay I love this review. You two are so hilarious. A woman at work has been trying to get me to read this book for a little while. I've been wary because I'm not really into Christian fiction, but I might try it based on the fact that you seemed to enjoy it.